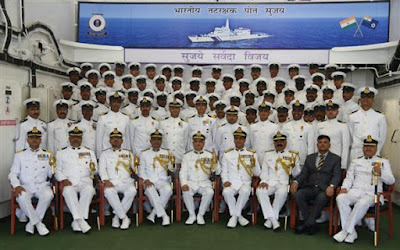 Indian Coast Guard Ship “Sujay”, the sixth in the series of six 105m Offshore Patrol Vessel (OPV) was commissioned by Director General Indian Coast Guard Shri Rajendra Singh at Goa today in the presence of senior officers from Coast Guard, CMD Goa Shipyard Limited and other senior dignitaries of the Central and State Government. ‘Sujay’ meaning ‘Great Victory’ is projection of Indian Coast Guard’s will and commitment “To serve and Protect” the maritime interest of the nation. The ship is based at Paradip, Odisha under the operational and administrative control of Commander Coast Guard Region (North-East). This 105 meter OPV has been designed and built indigenously by Goa Shipyard Ltd and is fitted with state-of-the-art navigation and communication equipment, sensors and machineries. The features include 30mm CRN 91 Naval Gun, Integrated Bridge System (IBS), Integrated Machinery Control System (IMCS), Power Management System (PMS) and High Power External Fire Fighting System. The ship is designed to carry one twin engine Light Helicopter and five high speed boats including two Quick Reaction Inflatable Boats for swift boarding operations, search and rescue, law enforcement and maritime patrol. The ship is also capable of carrying pollution response equipment to contain oil spill at sea. The ship draws 2350 tons(GRT) propelled by two 9100 KW diesel engines to attain a maximum speed of 23 Knots and has an endurance of 6000 NM at economical speed. The sustenance and reach coupled with the latest and modern equipment and systems, provides her the capability to perform the role of a Command platform to accomplish all Coast Guard charter of duties. 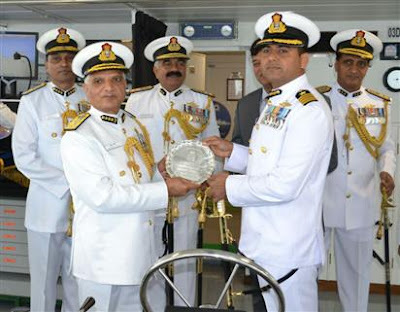 The ship on joining Coast Guard fleet at Paradip, will be deployed extensively for EEZ surveillance and other duties as enshrined in the Coast Guard Charter, to safeguard the maritime interests of India. Presently, Indian Coast Guard has a fleet of 134 ships and boats and 66 ships and boats are at various stages of construction at different shipyards in India. 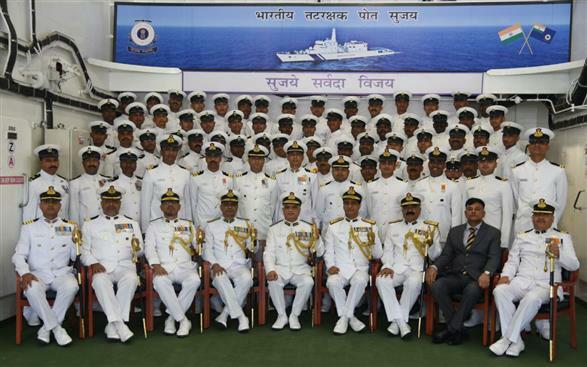 ICGS‘Sujay’ is commanded by Deputy Inspector General Yoginder Dhaka and manned by 12 Officers and 94 men. The commissioning of ICGSSujay will enhance the Indian Coast Guard’s operational capability to discharge the multifarious maritime tasks. The induction of a sophisticated and state-of-the-art OPV will give a fillip to the maritime protection of our vast coastline of Eastern Seaboard in general and the maritime state of Odisha and West Bengal in particular.